Captain Kapil Kundu, 22, was among the four soldiers who were killed in firing by Pakistan troops. Jammu and Kashmir: A day after four soldiers, including a captain, were killed in shelling by Pakistani troops in Jammu and Kashmir's Rajouri district, there is an eerie calm in the region. The shelling has stopped and the forces are keeping a close watch. Over 80 schools in the district are closed and people have been told to stay indoors. India has also lodged a strong protest with the Pakistani foreign office after the four soldiers died in firing by Pakistani troops, people familiar with the matter said. 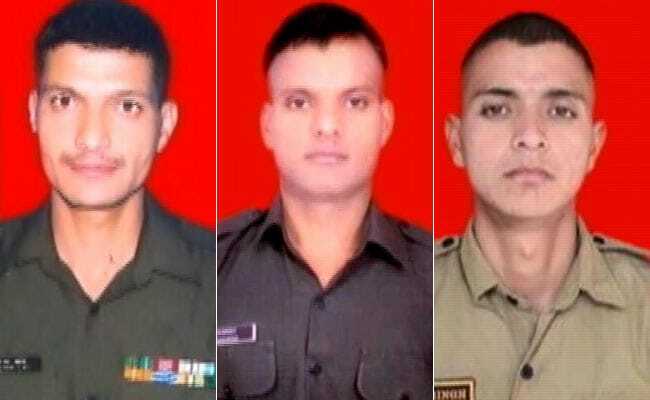 The bodies of Captain Kapil Kundu, 22, Rifleman Ramavatar, 28, Rifleman Subham Singh, 22 and Havilder Roshan Lal, 42, will be sent to their hometowns after a tribute in Jammu. "We will not forgive Pakistan's actions. It will prove to be Pakistan's foolishness and will cost them dearly," Hansraj Ahir, Minister of State Home Affairs said. (Left to right) Havilder Roshan Lal, Rifleman Ramavatar and Rifleman Subham Singh. Pakistan intensified firing at Indian military posts and villages along the Line of Control or LoC in Poonch and Rajouri districts on Sunday morning. A teenage girl and a soldier were also injured in Poonch. "Indian Army retaliated strongly and effectively and heavy damage has been inflicted on Pakistani Army posts," said a defence statement. The Army said that Pakistan troops fired five or six anti-tank guided missiles indiscriminately in the area, at least one of which hit the bunker in which the soldiers were positioned. The incident took place at an altitude of 3,000 feet in a densely forested part of the LoC in Bhimber Galli in the Rajouri district. The Army is also investigating whether Pakistani forces fired an artillery shell directly at the bunker. It was the second time in three days that the Pakistani Army targeted Poonch. They had attacked military and civilian facilities in nearly a dozen areas of the Balakote sector last week. Indian forces say the first month of the year saw over 130 instances of ceasefire violations by Pakistan, the highest since 2014. At least 14 people -- eight civilians and six security personnel - were killed in Pakistan firing in the Jammu region between January 18 and 22. More than 60 people were injured and dozens of homes were destroyed in the shelling.